This crowd-pleasing remake of the 1960 Western (itself an adaption of Akira Kuraosawa’s 1954 classic Seven Samurai) brings a 21st century refresh to the star power and charisma that made the original such a success. The Magnificent Seven may not be an entirely necessary or reverent update but with such a timeless story at its core, it seems inevitable that this tale will be retold for years to come. Besides amping up the action level a considerable amount, director Antoine Fuqua also touches on themes of race and poverty in ways that make it more relevant to the current cultural climate. Denzel Washington fills the Yul Brynner role as warrant officer Sam Chisolm, who is called upon by the recently widowed Emma Cullen (Haley Bennett) to put a stop to the tyranny imposed by the villainous miner Bartholomew Bogue (Peter Sarsgaard) on her small town of Rose Creek. To get the job done, Chisolm recruits six willing men with varying backgrounds, including the misfit gambler Josh Faraday (Chris Pratt) and legendary sharpshooter Goodnight Robicheaux (Ethan Hawke). After running a smaller group of enforcers out of Rose Creek, Chisolm and his band of outsiders help train the locals to defend their town against the impending return of Bogue’s looming army. The stellar cast of the original, which also included screen legends Steve McQueen and Charles Bronson, was one of its most notable attributes and the same can also be said of this newer iteration. Washington is the perfect fit for a towering, no-nonsense gunman and Pratt once again channels his likeable goofball energy into another winning role. Other standouts in the group include Byung-hun Lee as the knife-wielding assassin Billy Rocks and Vincent D’Onofrio, chewing up the scenery as a hunter buried under layers of animal pelts who speaks with an oddly high voice that had me cracking up during most of his line readings. 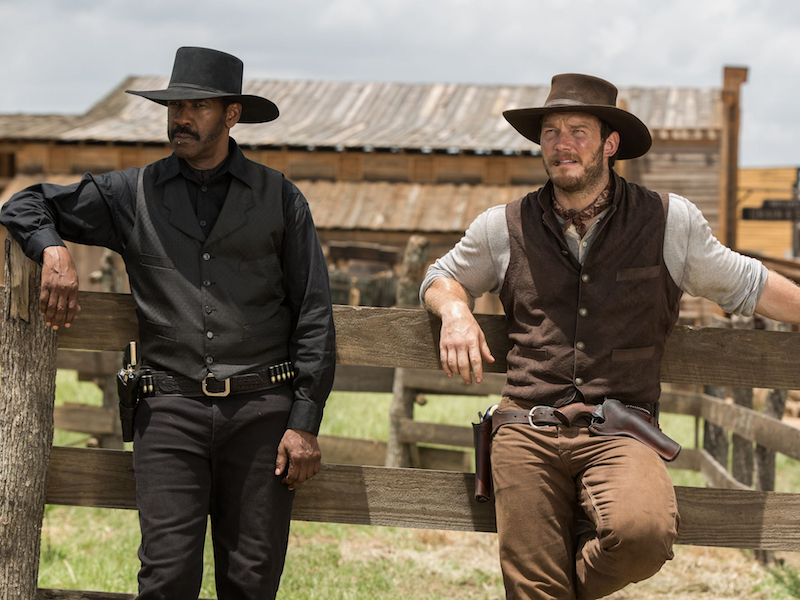 One area in which The Magnificent Seven is markedly improved over its predecessor is in the staging of the action sequences, which supplants the inconsistent foley gunshot sounds and unconvincing wound-clutching for violence that feels believable without being gratuitous. One of the highlights of Fuqua’s last Washington collaboration The Equalizer was the climactic standoff in a hardware store and he employs the same kind of cat-and-mouse tactics with the showdowns here too. The pacing could still stand to be a bit less frenetic but his camera gives us enough room to breathe and a tactile sense of location within the confines of this modest town. Traditional Westerns aren’t nearly as common now as they were in the ’50s and ’60s, as films like Hell or High Water and The Revenant have incorporated Western themes into more modern and experimental forms of storytelling. These twists on the genre can obviously lead to excellent results but there’s also something satisfying about seeing a no-frills, popcorn shoot-em-up like this, especially when the direction is so sure-handed. Depending on how The Magnificent Seven fares at the box office, it may lead to a slew of other Westerns like it for a younger generation to call their own.